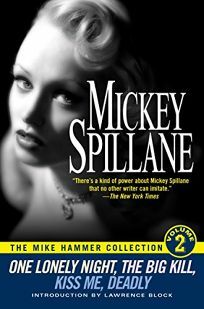 Close on the heels of Volume 1 (Forecasts, May 14), The Mike Hammer Collection: Volume 2 collects another three Mickey Spillane novels: One Lonely Night, The Big Kill and Kiss Me, Deadly. Introduced by multiple Shamus- and Edgar-winner Lawrence Block, the collection features Spillane at his finest (i.e., most vulgar, wise-talking, cynical, noir; most B-movie-poetic, etc.). The first story begins, ""Nobody ever walked across the bridge, not on a night like this."" Except, of course, our friend Mr. Hammer; readers will feel compelled to follow.